...At Your holy temple I will bow in ﻿reverence for You." Some of you may know that we have been in the process of relocating for the last few years, and that it's been a painstakingly-slow, emotionally-draining process. Well, it's all coming to an end, and it looks like we're going to survive after all. The ceiling went in Friday and Saturday. This week -- carpet, tile, doorknobs, and other finishing touches. Next Sunday -- we walk out the doors of our old sanctuary for the last time, and then that Monday -- we clean up and start moving in to the new one. My eyes are welling up with tears that this day is finally here. Sometimes I wasn't sure we'd actually make it; and even last week, it still felt out of grasp -- that there'd be more delays upon delays. But now it's suddenly looking so "finished". The dude is concerned that he won't be able to preach, that the emotion will just be too overwhelming -- to have cast a vision so long ago, and to see it coming to pass. 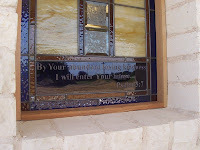 Someone donated money designated for stained glass windows, and we were happy to put some in! Here's the one over the baptistry. The dude thinks it looks, "joyful".